A Cooking Bookworm: HELP! What kind of pottery is this? ...and a GIVEAWAY! HELP! What kind of pottery is this? ...and a GIVEAWAY! 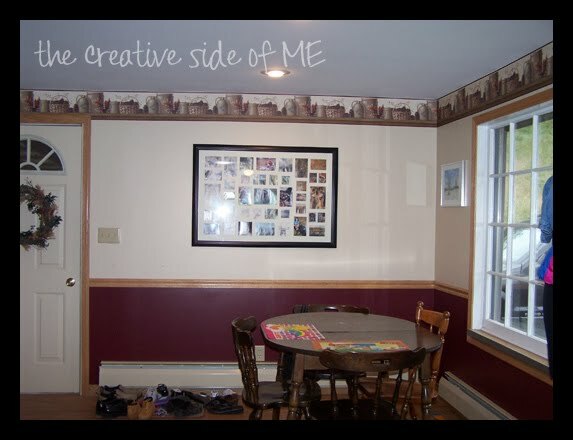 I just repainted my dining area, and I love it! I'm always eyeing dining sets, and maybe someday I'll have one like this! Isn't it pretty?? But, until I can replace my seen-better-days-before-two-toddlers-with-spaghetti-o's garage sale table and mismatched chairs, I'll just be happy with my paint job facelift! Now, here's where I need your help! Please! We have plans to redo/finish my kitchen next year and I'd like to pull out the blue from the pottery. I'd also like to start collecting some of this pottery/stoneware to decorate my kitchen with. Soo, what is it? It's hard to google something when you're not exactly sure what it's called. So far I've gotten salt-glazed pottery and New England stoneware. But, not all of it has the blue on it (which I like). And, where can I find it? Although that might be solved once I know what it's called! For reading this far...and helping me out, I'm so excited to announce another fantastic giveaway from CSN Stores!! Entries accepted until Friday, October 15, 11:59 PM (EST).Winner(s) will be chosen by random.org and winner(s) will be notified by email. Winner(s) must confirm prize email within 48 hours or another winner(s) will be chosen. I don't know what kind of pottery that is, but it is pretty! I would spend my gc on Rachael Ray's Lasagna Lover Pan in Blue! I love it!! What a great post. Wish I could help you with that pottery.. I have no clue.. It's just called stoneware... You can find it in LOTS of antique shops in New England. The cobalt blue is the most common color, so you should be able to find it no problem. I have several old jugs scattered around my house. I love it too! I think you're in the North East (?) but if not, you can probably find reproductions of it at craft fairs or online. If I see some, I send you a link! I'd get the Carlos by Carlos Santana Saber Women's Ankle Strap Sandals in Mustang. I would spend it on the bassett mirror silver antique beaded leaner mirror. I would love to put this towards an espresso machine! I spend it on some Briggs & Riley luggage. I would get some Paula Deen cookware if I won! I would check out the antique shops in your area with a photo in hand. Pick their brains. Then check out antique shows looking for pieces. Fall seems to be the time to antique shop. Follow and Tweeted about thise! I need a new crock pot. Sorry I can't help with the pottery. It's pretty, though. I would love to use this toward a new coffee maker! You are now following The Creative Side of Me...and other random ramblings GFC! Following The Creative Side of Me via Networked Blogs! Fan of The Creative Side of Me on facebook! Sign up for Swagbucks using YOUR referral link! I want the Evenflo Big Kid Booster Seat in Mercury. It IS gorgeous, isn't it? As for what I'd love to get from CSN? Some Rachel Ray Bakeware. I follow on Networked Blogs (under my name, Piroska). I would spend this on a Bodum Bean 8 Cup French Press! I need a dutch oven desperatly, with the cold season coming up I'd LOVE to have a great stew cooking at least once a week for my family! I would use this towards a davinci 4 in 1 crib in ebony! I hope someone can help you with your pottery! I follow via Networked blogs as SuburbSanity. I would get myself a food processor - because oh lordy I need one! I'd use the gift code toward a Bosu Balance Trainer. Sorry I can't help with the pottery! I love the Park & Sun Power Tetherball Set. Thanks! Not sure on the pottery. At CSN I like the earthpan skillet. My grandmother had pottery similar to that but I'm so sorry I can't find the name of it. I would love to get the PlaSmart PlasmaCar in blue! I'm following you on Networked blog user Lisa Garner. I like The Creative Side of Me on Facebook (Jane Eileen). I really like the City Scene Damask Duvet Set! I'm no use on the pottery - sorry - but I would definitely use the gift card to buy a wheely bug for my son for Christmas. So excited to see they carry them!